In recent time, titanium is considered as the futuristic material that anyone who want to take the lead in the world should try. But why titanium is even appreciated more than carbon fiber – the material that’s even arguably stronger than titanium? It’s because titanium overcomes pretty well two biggest drawbacks of carbon fiber: Easy damage and Not age well. 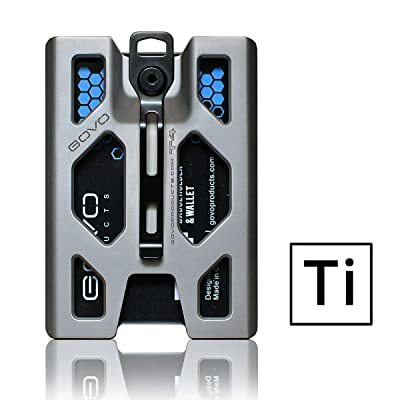 With a titanium wallet, it doesn’t fail catastrophically when being abused, not easily damaged, and importantly, age well even if exposed under lots of UV ray. 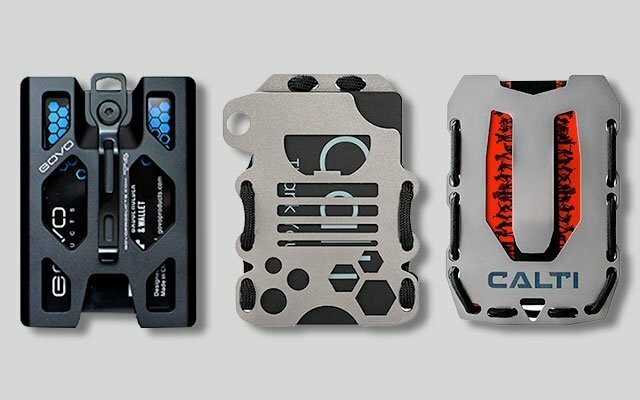 If you’re looking for the best titanium wallets that match your demand, preference, and budget. This collection will help you! Read on! Calti is a Ukraine-based brand that I’ve paid lots of attention recently since copping this wonderful titanium wallet. Its sophistication completely exceeded my initial expectation. For the price, you can’t beat this, especially the impeccable look highlighting with scratch resistance. It’s a big thank you to the glass balls finishing to upgrade both function and outlook aspects of the wallet. Besides, is the laser cut technology to emphasize its incomparable precision. 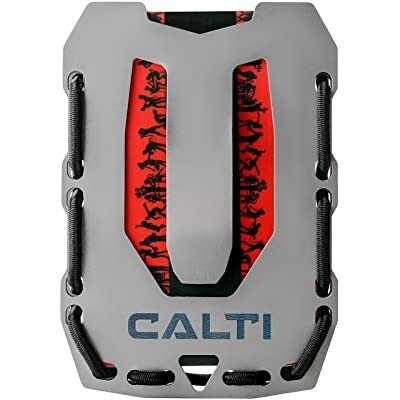 This Calti wallet also clears my misleading about its real weight. I used to think that titanium was much heavier than the aluminum or the steel. Turns out this pure-titanium wallet just weighs less than 50 grams -roughly 1/3 my regular wallets’. By the way, this kind of material is claimed as the strongest to deliver decent longevity. I’ve also searched a little bit about this model before purchasing to find that no breakage or damages are complained in it. Besides, their lifetime warranty encouraged me a lot to try. Thankfully, that’s the most satisfying decision in my life. The wallet comes in really compact sizes with minimal construction. Holding perfectly 1-15 cards without a burden and besides, are some folded bills strapped on its outer money clip. You can freely customize its capacity by giving some adjustment on the cord. Also, is the custom in cord’s colorways. I think this is a perfect choice for those who love carrying less with extra protection and cool look. However, big hands might find this a little bit difficult to use due to its too small and thin silhouette. 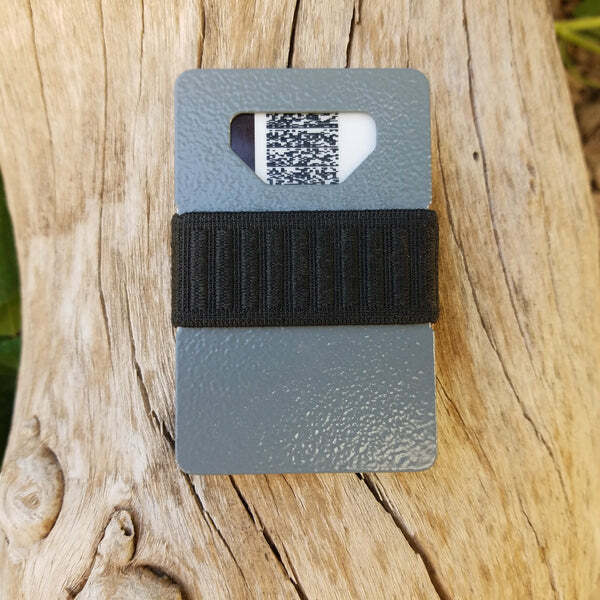 There are many moments that you will want to carry your wallet with hands free, which is the reason I suggest this Titanium model equipped with a badge holder. With it, you can clip on your belt, backpack, pocket, keychain or carry with a lanyard. This component is crafted from high-grade manganese steel to ensure no breakage. Even, the manufacturer secured it by a steel fastener so, just worry free of losing your ID badge. What I love the most in this product is its anti-scratch ability. There’s a special screen attached on the inside that not only avoids unwanted scratches from the outside, but it also enables to prevent from the inside. It’s made out of high transparency polycarbonate to ensure the highest performance as well as durability. Don’t fret, photo, barcode or small texts will be visible from it. Lastly, is the capacity which is also the weakness of this wallet. It can only load within 1-4 cards with 3-5 folded bills to fit only minimalist people, I guess. Besides, are the steel spring to deliver better elasticity than the plastic snaps with decent protection. In general, I love it unconditionally. The second Calti in this collection, which is my high recommendation for those who are in need of the RFID Blocking Technology feature. But don’t worry, its total weight and dimensions won’t be bulkier. The wallet still features 50 grams in weight and 3.81” x 2.63” in size – very compact to stay in your pockets without a burden. 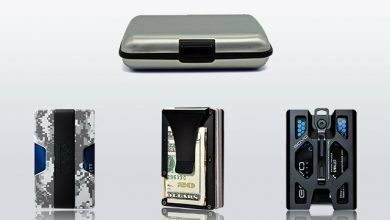 Moreover, unlike other shaped EDC models, this one hold cards and bills with ultimate protection without falling off accidentally. Thanks to the elastic cord, you can custom this wallet to get the best match with your essentials’ load. Maximumly, it can keep 20 cards with ease. Plus, in the package, there is an extra cord in case the stock one gas a detect. I really appreciate that! Due to its cool design and functionality, and besides, is the lifetime warranty, considering it as a meaningful gift for your loved ones is not a bad idea. 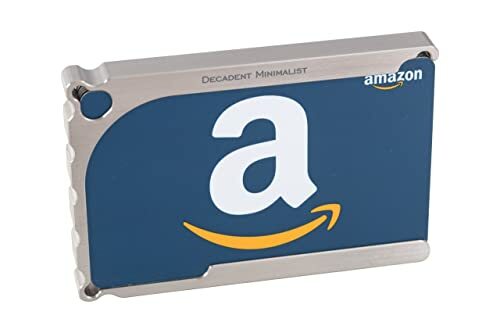 Different from other counterparts in this field, this Decadent Minimalist wallet comes in a solid metal block with precise cutout to fit normal card size. In turns, they provide 3 size options for 4, 8, and 12 cards. Besides, are 4 different colorways to choose from. The best thing about this kind of design is no need of adjustment if that’s what you are looking for. In turns, pay attention to your card’s thickness. For examples, in the 4-card wallet, it can fit more than that amount with thinner cards, and maybe 3 for the ones with raised numbers. My tip for that is putting them on the outermost to save space on the inside. Now, what would happen if we don’t fill this wallet with the indicated number of cards? Nothing! It’s even easier to stuff in and out with some slack. Not to mention to minimal wears on your cards’ surface. 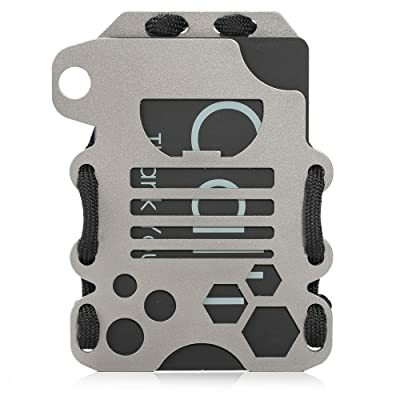 Another idea popping up to my head when it comes to this metal wallet is looping a lanyard on the hole at its corner to use as a neck wallet or simply connect it to my car mount, backpack or belt. Very hand-free and convenient! All in all, there are many interesting ways to use it! The most minimal wallet out of the bunch. 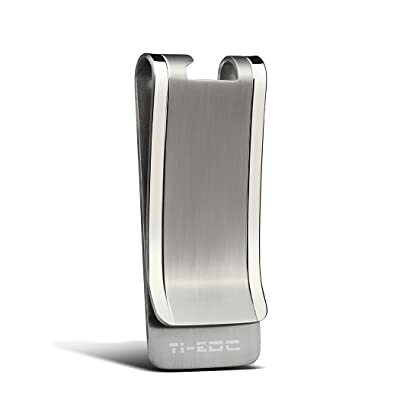 It in other words is a titanium slim money clip that’s made from Titanium Alloy TC4 by TI-EDC, emphasizing with decent strength and lightness. Thanks to this material choice wise, this wallet can repel corrosion efficiently. Besides, are the non-magnetic and hypoallergenic ability. 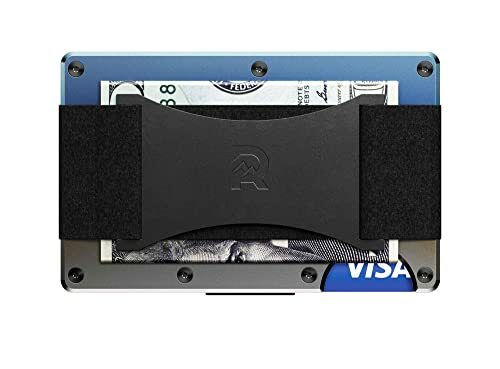 This kind of design is perfect for those who don’t prefer the bulk in material and heft, but just a simple “item” to keep their cards and cash in one place. Also, it’s a wonderful bottle opener sometimes during a party. Very convenient and an impressive way to girls. I’m not joking! However, you need to accept the truth that it’s lack of protection to your essentials, especially your paper currencies. They tend to easily bend the corners or tears if placed with zippered stuff. Next up, is the pop star of today – The Ridge Wallet. On the first glance, its same-same outer performance might make you wonder why it has such that expensive price. Well, the true value is usually invisible, guys! That’s the quality! When handing a Ridge Wallet and other carbon fiber on hands as well as spending time to experience it, you will feel on your own the difference, clearly. I find no one complain about the Ridge Wallet’s quality. NO ONE! In other words, it’s very superior to be a timeless piece with high fashion vibe. The most worth-mentioning is the elastic strap. Whilst other brands usually choose to cut off its quality to give more competitive price, the Ridge Wallet on the other hand still keeps material quality in priority. Turns out they become the leader in this industry despite the high price range. With this, you can put in 1-12 cards without bulk, and the money strap can keep 5-8 folded bills. Plus, is the RFID Shield to protect your private information against unauthorized scans. 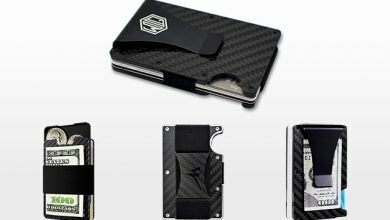 Aside from the titanium wallets, Ridge also provide 2 other options which are aluminum and carbon fiber, I’ve another article sharing all my thoughts about all of them. 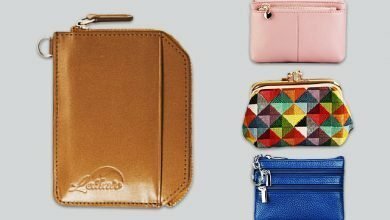 If you’re interested in this brand and their wallets, I bet my sharing will help you the best. 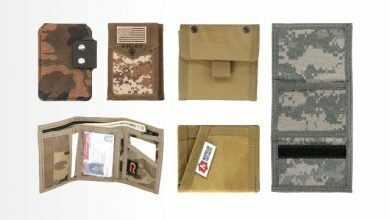 The very first USA-made wallet in this list and this is a titanium model from CRATE. Highlight with a perfect combination between luxury and practicality, there are many interesting things to talk about this product. But might I start off with the aerospace grade materials. Including titanium, aluminum and carbon fiber, no doubt its durability is on top of the line. Besides, is the unmatched level of customization in the color of elastic bands and mid-plate inlay. There are more than 100 options to choose from. But the real fun lies in its “K-tool”. It’s a component, sizing 3.8” x 2” to keep your small accessories along with your cards and cash, such as keys, bandage, coins, and so on without fall off. Other than that, the K-tool can be used as a bottle opener or a phone stand when in need. Aside from such excellent additional functions, CRATE doesn’t forget its major duty yet. Their wallet comes in moderately huge capacity of 8-10 cards, which I believe it will fit your daily life. Such a multifunctional item that you should consider in this modern life. Another notable wallet is the Omega Compact Solid Titanium Wallet. The best thing about this product is thorough exploitation between sophisticating craftmanship and precise machining. Omega impresses its customers through the excellent cutout and extremely exquisite engraving to the smallest details. It’s shown clearly in the front plate of this wallet as well as the smoothly-ground corners. Speaking of the functionality, there’s diverse world inside a minimal construction. You can put in 6-8 cards and 3-5 folded bills on the inside. When you want to take a specific card, just push your thumb on the strap, cards and cash will pop up. Press slightly two plates on the bottom, they will present one by one to easily pick the card you want. After that, just push them back. Other than that, this thumb strap is designed precisely to open a standard bottle with ease. Very smart, don’t you think? Omega don’t forget to equip their wallet with RFID Shield to leverage your privacy completely. Speaking of customizing, there are many engraved design options to choose from. Or, you can ask them to engrave text or message as you want. It’s really, really beautiful! MaxGear is another USA-based brand that you can feel ease in mind of a high-quality product. It’s real that the material is always crafted from the stainless steel covered by black titanium to deliver a good feeling touch. But take note that the bottom card holder as well as the lid come in different material. They are orderly durable plastic and metal. The most satisfying thing in this model is their free-fingerprint feature that in other brands, I’m usually stuck in this issue. Besides, it can prevent scratches to leave an always-like-new outlook, enhancing your professionalism of all the time. 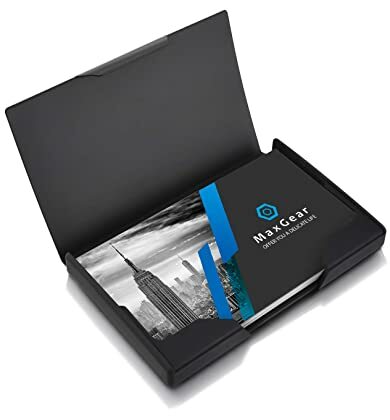 As this product is designed to hold your business cards, it’s lined with felt material for extra protection. However, it’s not thickened up at all. The capacity is still within 10-15 business cards or 5 hard cards to be a good choice for your daily use. Guys, this is a must-have item in your EDC gear collection. Like Ridge, Spine started their career in Kickstarter and gained lots of success since then. They now have a website where you can purchase their products more easily. The Spine Titanium Wallet is much more affordable than Ridge and another distinction lies in their rougher surface. 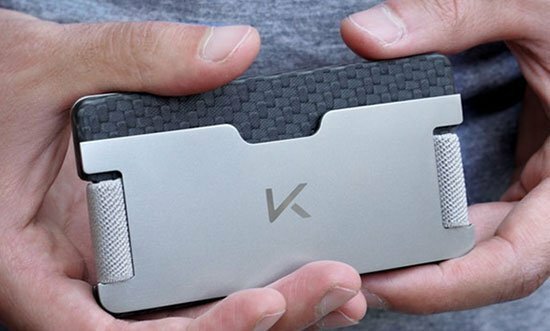 It nails up extremely minimalist design with one metal plate and one cash strap, making it the lightest titanium wallet on the market, but also one of the strongest. As mentioned above, titanium is the most durable kind of material, it can last up 5 years without a scratch or damage. However, during such this time, might you have to change its elastic band once or twice due to how frequently it’s used. But the good news is Spine also sells replaceable bands so that you can cop one and change up whenever you feel so inclined. Fans of Spine also give compliments on how elastic of this band. 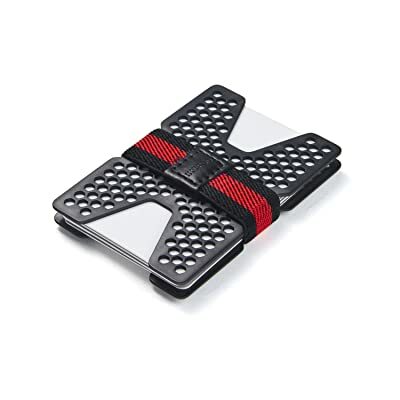 It can hold securely 1-10 cards and on the other side of the metal plate, is about 2-7 folded bills. A full package of the Spine titanium wallet includes 1 metal plate, 1 black band, and no logo. How perfect! Take note that the plate is guaranteed to be anti-allergic, non-magnetic, rust-proof and non-corrodible. So, even if you have sensitive skin, just worry free with this model. Available with a heat treated, removable Dango multi-tool with emphasis on 14 functions. Other than that, there are still some more minor advantages, which are the top-grain leather material, the mil-spec bolts for extreme durability. Or the TSA compliant. Hence, if you’re a survival person, this can’t be out of your list. Pick one! For more suggestions of Dango wallets, take a look here. 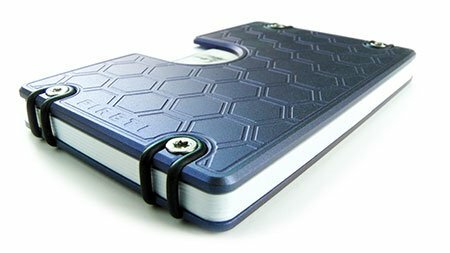 Out of a bunch, the Ikepod titanium wallet is outstanding based on its unique, hive-shaped metal plates. But such that design doesn’t sacrifice its RFID-resistant feature. The manufacturer guarantees that their product can protect users from 13.56 MHz – the RFID-based bank cards, passports that are read and duplicated. One special thing about this wallet is its extra elastic band. The full package consists of 2 metal plates and 2 cash straps – one bigger and one smaller to fit different numbers of cards. Capacity is 2-12 cards. Take note that the metal plates are MIL-spec Titanium alloy, which is considered 50% lighter than steel. Hence, even though it can’t be as lightweight as the aluminum, this wallet still impresses users by its decent lightness. Last up, is its 5-year warranty that will encourage you to pick it with more confidence.